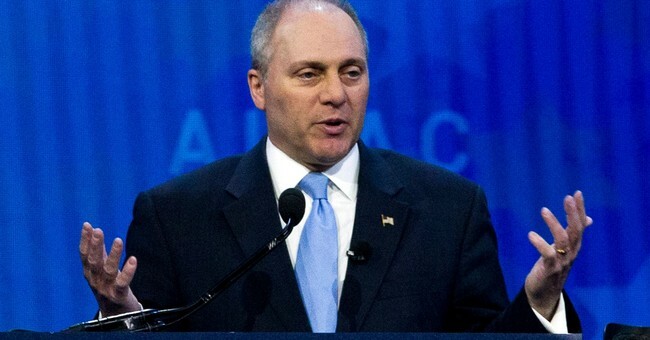 In June 2017 Scalise was shot and nearly killed by a Democrat during practice for the annual congressional baseball game. Because he was (and still is) part of House leadership, his security detail was on scene that day. Without them, it would have been a massacre. "The first place I want to go to thank true angels along the way starts with the United States Capitol Police. When I was elected Majority Whip -- as you know the elected leadership has a security detail. And if anybody ever wondered why we're assigned security detail, I surely found out that day. And let me tell you, I want to specifically mention Crystal Griner and David Bailey. Crystal and David were assigned to my security detail that morning. And day in and day out they're part of our family. Jennifer and I truly do treat them as part of our family because they are with us everywhere we go," Scalise said during his triumphant return to Congress in October 2017. "Let me tell you, if they didn't act so quickly -- and even after being shot both themselves, continued to engage the shooter and ultimately got him down, which not only saved my life, but saved the life of a lot of other people that are here in this chamber today," he continued. After surviving the attack, Scalise told Fox News anchor Martha MacCallumn his support for the Second Amendment was bolstered, not diminished. "Have you, your experience of your own, has it changed how you feel about any of that [gun control/Second Amendment]?" McCallum asked. "I think it's fortified it because first of all, you've got to recognize that when there is a tragedy like this, the first thing we should be thinking about is praying for the people who were injured and doing whatever we can to help them, to help law enforcement. We shouldn't be first thinking of promoting our political agenda. I think we see too much of that where people say 'we need more gun control,'" Scalise said. "First of all, look at some of those bills. Those bills wouldn't have done anything to stop this. The gunman actually cleared background checks, so to promote some kind of gun control I think is the wrong way to approach this." "Frankly what I experienced was when there was a shooter, luckily we had Capitol Police there with their own guns. Every single day in America regular citizens that just have a passionate belief in the Second Amendment, who have their own guns, use guns every single day to protect themselves against criminals...that's a different side of the story that I think is important. People use guns way more to defend themselves against criminals than criminals use guns to hurt people," he continued.